Up in Asheville the other week, I wandered into a very cool sewing store in the very, very cool West Asheville neighborhood. As I was chatting with the owner, she mentioned how many twenty- and thirty-something women come to her weekly sewing class in the hope of making something they could then sell for a little extra cash. “Women used to call it ‘egg money,’” she said, laughing. Egg money (AKA “egg and butter money”) refers to the cash farmwives used to make off their hens, which they would save for a rainy day, or simply use as well-deserved spending money. The term “pin money” was sometimes used in a similar way in more suburban settings, referring, in a slightly condescending way, to a woman’s part-time earnings. Another woman I spoke with recently, an expert on crafting-as-business, introduced me to the concept of the “side hustle” – the “something extra” you do on the side, in addition to your job or your domestic responsibilities, to make a little $$ for your family. Though the term comes from the African-American community, it’s something cash-strapped women of all colors have been doing since pretty much forever – selling homemade sandwiches from a cooler on your porch, taking in mending work, teaching piano. Now, the side hustle’s back, in a modern way, and it’s attracting the middle class too. With the economy in the toilet, it seems like everybody is looking for an at-home cash sideline – especially women, who are more likely to be working part-time or staying home with children. The rise of craft fairs, artisan markets and online marketplaces like Etsy (97% female!) have made the concept of “egg money” or “side hustle” seem newly viable. Make great jam? Why not sell it on Foodzie? Blogging for pay is often a 21st century side hustle, one that’s particularly appealing to stay-at-home mothers. 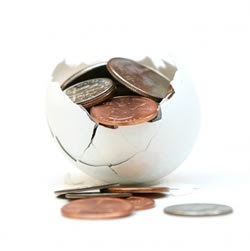 And when it comes to so-called “egg money,” it’s back too – literally. When you have your own backyard chickens, they lay a lot of eggs. What to do with the extra? Sell them, of course (unless you really, really like omelets!). I’ve been doing that for years! I thought, when first hearing about the concept of side hustle. As an underpaid newspaper reporter, I used to freelance for my own paper’s real estate section on the weekends. When I was working 60-hour weeks at a magazine, I also blogged at night for $10 a pop. As a freelancer, I spent a brief, humiliating period writing for Demand Media, the notorious “content farm” that brings you such gems as “How To Eat a Peanut Butter and Jelly Sandwich” and “Ideas for Organizing Scrunchies.” My reasoning went something like this: hey, I’ll get really quick at this, spit out two articles a morning, and make $30 before I even get out of bed and start my “real work.” If I work 7 days a week, that’s $210! $840 a month! My side hustles kept me solvent, but they were not, I must admit, advantageous to my career. The time I spent making extra cash on tiny, byline-less blurbs took away from the time and energy I could have spent going after bigger, more interesting, better-paying stories. Of course, since my side hustles were more about paying for a new laptop rather than feeding my children, I had the luxury of stopping, and I eventually did. I’m curious about the economics of this new “side hustle economy” – who, exactly is doing it? Why? How much do they make? How much does this affect women’s decisions to pursue full-time work? Is the “multiple part-time income streams” model, so common among underemployed Gen Y-ers, the way of the future? Does this have the potential to be more than a marginal economy? Do any of you have an at-home side hustle? Sell scarves on Etsy? Make pies to sell at the farmer’s market? Blog about your DIY projects for cash? How’s it working out? I, too, have stopped the side-hustle of blogging on the side, for the same reasons that you did. And though I love knitting, there’s no way I could make any money selling things I make – it costs $20-30 in yarn plus about 6-8 hours just to make a sweet pair of felted clogs. I can’t imagine charging someone what it would cost to cover the yarn and my work at minimum wage – so I knit as a treat to myself and to those upon whom I bestow my gifts. Ditto for my chickens’ eggs – I end up giving them away. I guess we are, as you say, lucky that we have the luxury of choosing whether or not we hustle on the side. Great reads; can’t wait for the book! “ideas for organizing scrunchies” ha ha… I want to read that! I had a side hustle of weekly baking for a local cafe. (The thought was: hey, I’m baking for our family anyway, so why not double up?) Although the cafe owner paid me generously (75% of her retail price, what a pal) It was actually more about vanity. I was paid about $50/week + plenty of kind words (which as MasterCard tells us, are priceless).